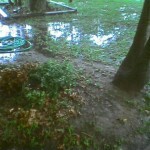 This is a view of the pond forming in the front yard. We expect it to rain on and off most of the day. Happy July 4, 2006. This entry was posted in Personal and tagged July, rain, weather by Chris Siems. Bookmark the permalink.